14th April - Portland - final round hosted by Portland & District Adult Riding Club. SEDA hosts the third round of the Crater Caves and Coast Series, and entrants must be HRCAV members. Entries must be on the standard HRCAV entry form (which is also included with the flyer and CCC Series rules, in the pdf in 'Forms'). We will be using the July 2018 editions of the HRCAV dressage tests. The HRCAV standard entry form may also be downloaded from the HRCAV website at https://tinyurl.com/nxlfth6. The election of office bearers for 2018/19 took place at the AGM on 12th November 2018. President is Andrea Riedel-Carrison; vice president Steph Cooper; secretary Ellen Linke, assisted by Gail O'Reilley; treasurer Diane O'Leary; event secretary Debbie Childs; publicity/media will be handled by Michelle Linke, assisted By Kate Martin, and the executive committee will also include June Whitehead, Carey Blizzard, Joanne Ancrum and Teresa Priddle. Monthly committee meetings will normally be on the 1st Monday of each month, at 7.30pm in the Stewards' Room at the Mount Gambier showgrounds. We must express a big thank you to the immediate past president, Kris Hancock, for all her work over the past few years, and to past committee member Lesa Van Uitert. 9.1. Registered Club colours must be worn at official events. 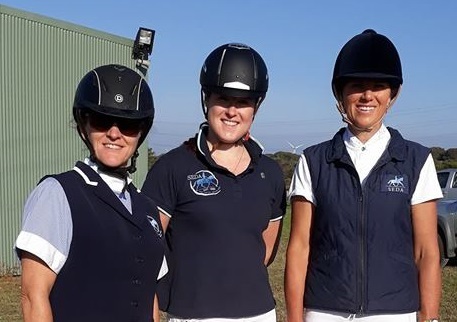 Club colours must be worn on the rider’s upper body with the Club name or logo displayed on the upper body garment and/or saddle blanket. The requirement to display the Club name or logo is waived for Led classes. All Clubs whose members wish to compete at Official events must register two main colours (these are navy blue and sky blue for SEDA). The main colours are to be used as the principal colour/s of the uniform and may be interchanged. At the discretion of the Club, other colours may be used in trimming, logos or similar embellishment. Subject to rule 9.2, a neutral or light coloured shirt or saddle blanket (not registered as a Club colour) may be worn as part of the uniform. In hot weather, the Ground Jury may allow competitors to remove outer layers of clothing and ride in shirt sleeves. If a riding vest is worn, the length of the vest must not extend past the buttocks. Shirt/skivvies worn under a vest must be of a contrasting colour. Hacking or riding jackets or any items of clothing designed to replicate a hacking/riding jacket are not permitted to be worn at Official events. 9.2. It is every Clubs’ responsibility to ensure that their members present themselves as neatly and professionally as possible. It is recommended that each Club have specific rules as to what they will allow their members to wear when representing their Club at Official events. AS/NZS 3838 (AU), ASTN F1163 (USA), PAS 015 (UK) and VG1 (Europe). The EN 1384 (Europe) standard is only acceptable for helmets manufactured prior to 2016. Long or short riding boots MUST be worn at all times whilst mounted. Enclosed footwear with ripple soles, including running shoes, may be worn in Led classes.